The most astounding feature of Ballistol is its versatility. Forms a protective film on metal surfaces Capable of creeping into fine cracks in metal. Use to clean, perserve, protect, prevent corrosion, maintain, impregnate and disinfect not only metal but also wood, hard plastics and smooth leather WARNING: Do not use on suede. DUE TO FAA REGULATIONS THIS ITEM CANNOT SHIP NEXT DAY AIR, 2ND DAY AIR OR INTERNATIONALLY. Easy to use cold chemical to remove old blue and rust. Will not injure base metal. Chemical action replaces hard work. A must before rebluing or browning! Removes completely all grease, oil, dirt, wax, silicone, etc. Safe, nonflammable. No rinsing necessary. Excellent for guns, tools and knives. Shown on this Raindrop Mokume, our Copper Patina instantly intensified the color of the copper giving an aged look to the metal. Sheath prevents rust, displaces moisture, protects for maximum rust protection, repels dust. Safe and easy to use, penetrates and blues steel instantly. Penetrates and blues steel instantly. Produces a blue-black finish that rivals the original. Safe and easy to use. The fastest way to touch up nicks and scratches. Use like a marking pen. The fastest way to touch up nicks and scratches. Use like a marking pen. Nothing to spill, simply rub on with applicator tip. 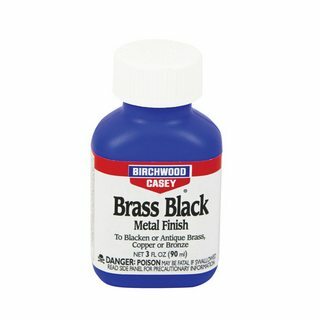 An easy-to-use instant chemical finish for copper and brass. Use to clean, perserve, protect, prevent corrosion, maintain, impregnate and disinfect not only metal but also wood, hard plastics and smooth leather. Deep blue-black finish. Blackens steel without degreasing. Ideal for quick touch-up of scratches or worn spots. Penetrates hard steel instantly. A cold chemical finish. Requires no heat or special equipment. Excellent for touch-up application on scratched aluminum surfaces. Plum Brown, a rich, authentic brown finish. Excellent for finishing new do-it-yourself muzzle loaders and for an antique look on your carbon steel knives. Penetrates deep into the metal for a long lasting finish. No need to soak and rub. This is the brush needed to produce a soft finish. Brass or steel brushes have four rows of .0035"- very fine, soft wire. Overall length: 8 1/4", brush portion is 4 1/2" long x 3/4" high. Clean and degrease in one easy step. Silicon free lubricant penetrates tight fitting areas for ease in releasing threaded fasteners. Will not ‘gum up’ or become sticky. Ideal for Knife and Gun repair. Use on metals, plastics and polymers to penetrate deep into the pores and leave a thin protective layer to prevent rust, corrosion and grime. 16.8 oz. Aerosol. Renaissance wax provides a barrier against fingerprints and water. With its high moisture resistance, it forms a durable, lustrous protective coating, Prevents tarnish, corrosion and remains completely waterproof.Nonstaining, non-abrasive. Guard your knives against the damaging effects of humidity, heat, dust, aging and ordinary wear. Use on all parts of your knife, blade and handle. A gun smith must have. Easy to use. No heating required. Rich, authentic brown finish. Excellent for completing new do-it-yourself muzzle loaders and for more of an antique look on your carbon steel knives.